From Shane Long’s work ethic to Shane Duffy’s surprisingly-high ranking. NOW THAT THE dust has settled, it seems like a good time to go back and take a look at the finer details. For what it’s worth, the Icelandic FA is also a client! Read into that how you will. InStat have been carefully monitoring the Euro 2016 tournament and we’ve decided to investigate Ireland’s numbers a little more closely. Bearing in mind that analytical and coaching staff at various clubs will be delving into the same research for recruitment purposes, some of the statistics are fascinating. It should also give Martin O’Neill plenty of food for thought heading into the World Cup qualification campaign. From Ireland’s six goals conceded, all came in the second half and only Hungary conceded more from four games. The average amount conceded by teams was 3.7. The Irish team was at its most vulnerable between 60th and 75th minute, leaking four goals (a whopping 67%) during that period of games. Five of the six goals Ireland conceded came from inside the box and from an average scoring distance of 6.3 yards. All six goals were conceded from open play – putting Ireland at the top of that particular list. More worrying, they conceded five of them from the right flank. O’Neill and co. can be pleased with the fact that Ireland didn’t ship a single goal from a set-piece – compare this to Hungary’s five or England’s three. When we scored, it tended to be a fast, frenetic build-up. Our duration of goal-scoring attacks was 5.8 seconds, which ranks us 16th from the 21 teams who found the net. The average was 9.7 seconds while Belgium are way out in front, having taken an average of 32 seconds to conjure a goal-scoring move. Similarly, it was unusual for Ireland to pass the ball to the net. Martin O’Neill’s side averaged just 1.5 passes in a goal-scoring move, with the overall average 3.6. As expected, Spain put together an average of 11.3 before scoring while Belgium weren’t far behind on 10.5. Surprisingly, Wales hit an average of 7.3 passes before finding the net to leave them third on the list. Inevitably, Ireland didn’t keep the ball too well – they held possession for an average of 11 seconds in a game before losing it, leaving them 20th from 24 teams. But, proving you don’t necessarily have to keep the ball to win games, Italy’s average was 11.2 seconds, leaving them in 19th. Spain and Germany lead the way, unsurprisingly, on 18.1 and 17 seconds respectively. Individually, the stats back up the general feeling that Shane Long worked tirelessly up front. He made 122 challenges – with 32% of them successful. That placed him third on the list, behind Iceland’s Kolbein Sigthorsson and Juraj Kucka from Slovakia. A lot of Long’s work (84 from the 122 challenges) came in the air – not his strongest characteristic – and he trailed only Sigthorsson on the list of players challenging for headers. Keeping with the notion of determination, Robbie Brady is another name that crops up positively. He averaged 4.8 tackles per game and was successful with 60% of them, leaving him in the top 20. He’s ranked 6th on the list of left-sided defenders (though he only featured there in the opener against Sweden), ahead of Jordi Alba, Patrice Evra and Mattia de Sciglio. Seamus Coleman with one assist and 83% pass completion, just about makes the top ten of right-sided defenders. Having only started in two games and despite his red card against France, Shane Duffy is ranked surprisingly highly in the centre-back category. But some of his numbers are very impressive, like winning 78% of his defensive challenges and 81% of aerial challenges while he racked up a 75% success rate with his tackling. He’s 19th on a list of 72 and ahead of the likes of Thomas Vermaelen, Toby Alderweireld, Ricardo Carvalho and Andrea Barzagli. All data courtesy of InStat. 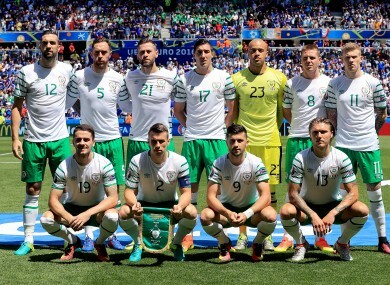 Email “Crunching the numbers: Some fascinating figures from Ireland's Euro 2016 campaign”. Feedback on “Crunching the numbers: Some fascinating figures from Ireland's Euro 2016 campaign”.